Do you want more life and business results? If the answer is yes, then you need proven life and business strategies to help you achieve the results you want. Get my FREE e-Book "The Productive Self" to find more ideas & strategies to help you become more effective in life and business. I am a business advisor and consultant. I help entrepreneurs, business owners, and freelancers to reach a bigger audience & grow their business while keeping a human face! Business success depends on the mental models and the business strategies you employ on a daily basis. I'll show you how to use the best personal and business approaches to get proven results. I develop and present ideas, strategies and approaches for leadership, strategy, operations, marketing, social media, and productivity. I consult, invest, teach and coach on small business strategies and marketing believing that with the proper knowledge, constant learning and hard work you can make a difference in the world and in your life! To experience my work, you can download now my free guide on how you could develop a more productive self, or read my blog and find more ways to become more effective on personal and business level! 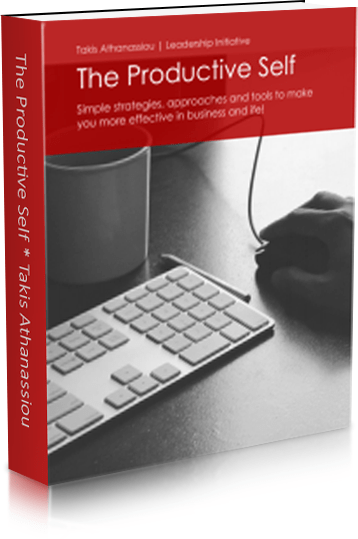 Takis Athanassiou is an e-Business & e-Learning consultant who writes about building a meaningful life. His blog posts are very personalized and focus on how to use your own strengths to become better at every aspect of life and succeed in every field you choose. His ideas about personal development are astounding and groundbreaking. Successfully running a business takes more than a great product. Knowing how to lead and communicate with the people you work with is just as important. But what if you’re not born with the leadership skills and communication savvy that moves masses? Fortunately, these skills can be learned and improved just like any other – and Takis Athanassiou shows us how. Do You Want More Results With The Strategies You Employ? If you want better results, you can access my best strategies and ideas for personal and business development leading to constant sustainable growth! Learn the mental and business processes I use to become more effective and develop proven and effective business models for my audience. > The leadership principles help me develop an award winning leadership and personal development blog and an active community of 21,000+ like-minded peers. > The productivity approaches I use to focus on what matters most and earn 5 more hours each week to do what matters most to me! > The proven business models I use to develop & grow traffic, conversion rates, revenue and income for my audience and followers. > The content marketing tactics permit me to develop more than 400 posts, 17+ books and e-Books, numerous courses, and many info-products in just few years. > The social media strategies I employ to contact, cooperate and network with more than 20,000 people from all over the world. Start now by finding out how to become more effective in what you do. You can subscribe today to my newsletter and I will send you a free copy of my e-Book The Productive Self : Simple strategies, approaches and tools to make you more effective in business and life along with my newsletter containing my best strategies and insights on leadership, innovation, e-learning, effectiveness and productivity!